No Barbie dolls -- check. No disparaging of my own body -- check. Frequent reminders that what's inside matter more than what's outside -- check. Daughter without self-esteem issues -- out of checks. I naively thought, when Tessa was an infant, that doing these checked items would go a long way to helping her develop healthy self-esteem. After all, she would have her own obvious inner light and beauty, as well as the benefit of my nearly 4 decades of working out my own issues wisdom to help her short-circuit the problems that can exist on a young girl's path. Hah! Now that I'm parenting an 8 year-old, a complex being with layers and layers of known and unknown facets, I can see that raising a daughter with healthy self-esteem is going to require a lot more than I thought it would. A new tool suited for this challenge was thrown across our paths recently. I was drawn, almost like a magnet, to a non-chocolate booth at the recent Chocolate Festival (imagine that: a room full of free chocolate and we wander off to a booth with no edibles). We walked by a pink-and-purple themed booth where some face-painting was taking place. While Tessa got hearts and stars on her cheeks and Reed got sword-bearing snakes (don't ask), I chatted with the radiant, statuesque woman who was responsible for the booth. She told me she had authored a book, a work she was guided to write, to help girls age 7-14 to recognize and appreciate their own inner beauty. The woman's name is Debra Gano (with her daughter, Elle, in the photo), a Colorado-based author and mother who is a former actress/model (and strikingly beautiful, not surprisingly), someone who made a nice living on her looks. She is qualified to tell what that does to a person's inner value. Disclosure: Debra gave me a complimentary copy of the first in the HeartLight Girls series called Beauty's Secret ($12 through Amazon and $18 on Debra's website). Beauty is a loved and loving daughter who has a brother and a good friend. Her life is full of joy and harmony, and one day she is discovered by a modeling scout, who invites Beauty and her friend to enter a pageant. Beauty's measure of her worth thus moves from inside herself to outside herself. In lush paintings that drew Tessa in and with with a storyline that appealed to her, we learn of Beauty's departure from Innocence, to the meanness of Narcissism and the return to herSelf, wiser than before. Debra's book has several high-profile cheerleaders: Marianne Williamson (A Return to Love), Jack Canfield (Chicken Soup for the Soul), Neale Donald Walsch (Conversations with God) and Dom Testa (Denver radio personality) among them. 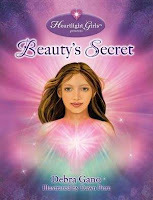 In addition, Beauty's Secret recently won the Coalition of Visionary Resources Award for Best Childrens' Book of the Year in 2008. But how did it play out for Tessa? It took us a week to read Beauty's Secret at one chapter a night. The message in Beauty's story is an important one, one that if absorbed will help a pre-teen understand what true beauty is, where it is housed, and how to let it shine even amid outer judgment. Beauty's Secret also has given Tessa and me a new vocabulary with each other for noticing when our heartlights are obscured, and a shortcut for reminding each other to shine our inner beauty. When Tessa veers toward the edge of meanness (which tends to occurs when she's not feeling self-love), I now put my hand on my heart, reminding her to go inside and find her inner light. While I don't expect the awareness of her heartlight to be a cure-all, this cue and its connection to Beauty's story has actually worked several times. Tessa and I are eager for part 2 in the series and beyond. We give four thumbs up. What do you think are the most important elements in raising children -- especially daughters -- with healthy self-esteem? thanks for the recommendation. I have 4 girls (3-14) will definately check out. I enjoyed reading this book with Tessa the other night. It had a lot of great messages in it. That sounds great. I will have to get it for my nieces. Running to Amazon to buy this book for *my* 8-year old and I to read together. It sounds like a lovely book with lots of food for thought to share between a mother and a daughter. Sounds like a great gift for my friends with girls!